Much has been said about the Green Bay Packers double-dipping into the well that was the cornerback pool in the 2018 NFL Draft as they selected Jaire Alexander and Josh Jackson with their first two selections. Alexander joins the Packers cornerback room having allowed the lowest passer rating on throws into his coverage among all draft class cornerbacks a season ago despite injuries. Jackson enters having finished the 2017 season as our highest graded cornerback in our four years of grading. 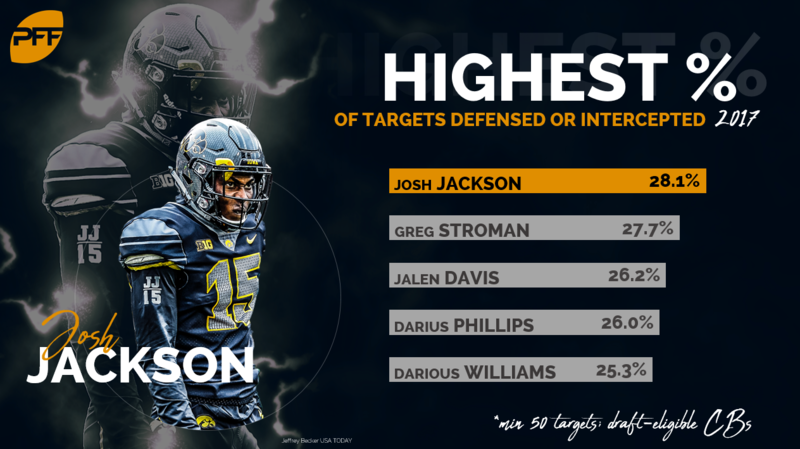 Jackson finished last season with 35 contested targets, contesting wide receivers in his coverage on 35 of his 87 targeted passes. He allowed just a 9.5 passer rating on these contested targets, also the national best. With the new duo at cornerback in Green Bay, it’s no shock that they were named as our most-improved team in the NFC North, a title that could contend as potentially the most improved unit across the entire NFL. The Packers finished 30th in coverage grades in 2017, showcasing their clear need for help in the secondary and why their double-dipping at cornerback with their first two picks make even more sense. Add in their selections coverage linebacker Oren Burks, interior defender James Looney and linebacker Kendall Donnerson and this Packers defense will look to contain some of the league’s top supporting casts in their division. On offense, Green Bay went to the well at wide receiver three separate times by drafting Missouri WR J’Mon Moore, USF WR Marquez Valdes-Scantling and Notre Dame WR Equanimeous St. Brown in the fourth, fifth and sixth rounds, respectively. Moore had an up-and-down career at Missouri but blew up at the Senior Bowl, supplanting his draft stock. St. Brown is a big receiver who dropped just six catchable passes during his college career while Valdes-Scantling is a deep threat. All three of whom will attempt to fill the void left by Jordy Nelson at wide receiver. Washington State’s Cole Madison was selected in the fifth round as he allowed just 22 pressures on 827 pass-blocking snaps in the Cougars pass-happy offense. He projects to guard with his size, but should help the Packers at either position wherever he sees the field.